It sounds too good to be true—a private, once-a-week, 25-minute full-body strength workout. Just you and a trainer in a low-key workout studio. You have probably discovered that we lose muscle as we get older, and if we don't replace the muscle, it is naturally replaced with fat. Weight training has been proven to help reverse the process, as well as increase metabolism, bone density, cardiovascular function, glucose tolerance, and balance. The Workout Garage program is probably not like any you've ever done. Our "slow-motion, high-intensity" weight training is not new; it was developed at the University of Florida School of Medicine in the early eighties. With this workout the major muscles and core are worked deeply and thoroughly. So much so that it only needs to be done once a week. The muscles reach maximum exertion in a very short amount of time by slowly lifting and lowering (slow-motion) the weight load without pausing between repetitions (high-intensity). It's perfect for busy adults and an excellent program for seniors. 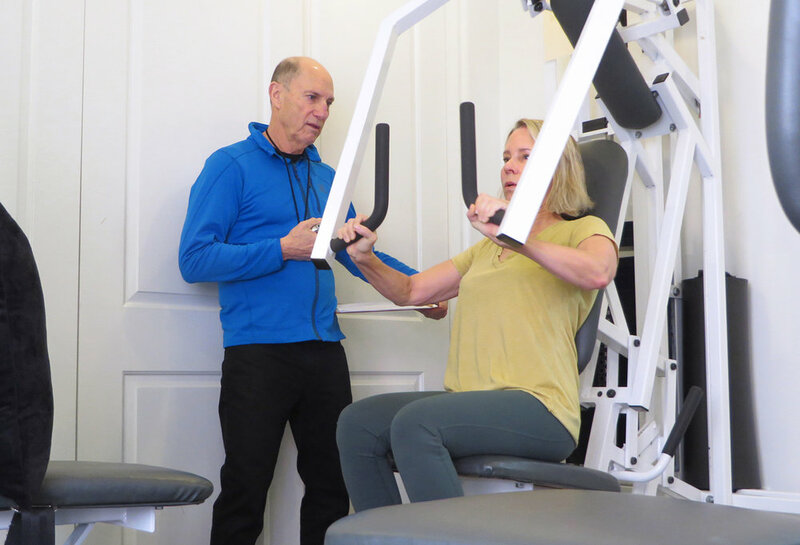 Owner and trainer Jeff Grossman customizes each session to each individual's ability and ensures proper form for a controlled and effective workout. Schedule an introductory session to learn if this is the right workout for you. No pulsing music. No juice bar. No social scene. The Workout Garage is all about a focused, core-strengthening, one-on-one full-body workout. Our slow-motion, high-intensity workouts are done on top-quality weight machines and customized to each individual, and any physical limitations are taken into consideration. (We have clients with hip replacements and knee replacements.) Each session consists of single sets of continuous motion reps on each of The Workout Garage's "Big 5" weight machines. Our no-distraction sessions last about 25 minutes and need to be done only once a week. The Workout Studio is in a former garage behind a home located in Pacific Palisades. Access is easy from Santa Monica and Malibu. Scheduling is flexible and sessions are usually available 7 days a week. 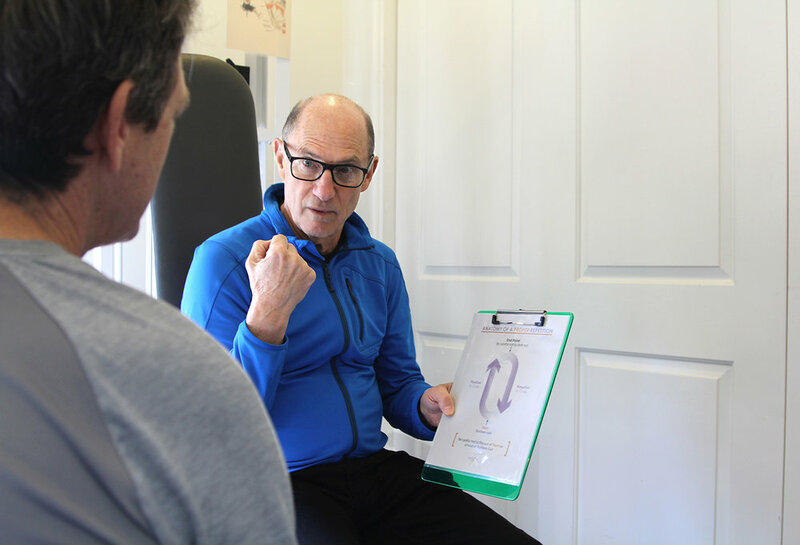 "Jeff is patient and professional, and his obvious dedication to his clients and their long-term health makes all the difference." "I always feel like I’m getting a really effective workout in a very efficient amount of time." "Jeff's workout is such an asset for our middle-aged bodies." "...the results have honestly been much better than I expected." "...the best part is that I know I am doing something good for myself." "I’m definitely stronger, and I enjoy the challenge of the workouts." Email Jeff Grossman at jeff@workoutgarage.com or call 424-237-4130 for all inquiries and to schedule an introductory session. The Workout Garage is located in the Alphabet Streets in Pacific Palisades. Each session is a private, individually-coached, 25-minute full-body workout on high-quality weight machines specifically designed for slow-motion, high-intensity weight training. Introductory Session: $45 75 minutes to learn about and experience a slow-motion, high-intensity workout and make sure it is right for you. (Waived if you purchase any package). If you refer someone who buys a package, you will receive one free session.